It was 2009 and the flash floods in the Tungabhadra left a trail of death and destruction. My parents and sister were among the group of pilgrims who managed to take the last KSRTC bus from Mantralaya to Bangalore. The bus was not in tip top condition, though it was a Volvo. The widow panes could not be closed and the chairs were not properly secured to the bus floor. Rain water was seeping through the window and my parents and sister managed an uncomfortable night. The same night, even as the bus was moving away from Mantralaya, flood waters entered the holy city and also washed way Bichale, the home of Appanacharya where Rayaru spent thirteen years. 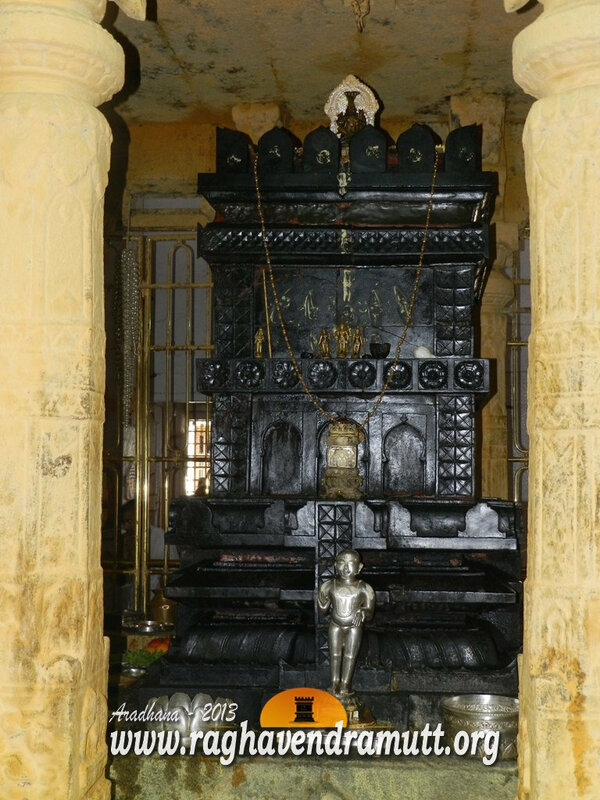 Mantralaya was completely ravaged and the Tungabhadra even entered the temple of Raghavendra Swamy. The house of Appanacharya where Rayaru lived was also completely destroyed. Today, Mantralaya presents a different sight. There are almost no remnants of the tragedy. The goshala, on the outskirts of Mantralaya, has been completely rebuilt. The temple too has been renovated and all the structures that were damaged have either been repaired or reconstructed. The road from the matha to the Tungabhadra has been re-paved. The Sri Raghavendra Swamy Temple (SRST) had embarked on a rehabilitation exercise with the help of devotees’ donations after huge losses and damage to property were incurred by the floods post Cyclone Nilam. The damaged furniture in the guest rooms and offices have been replaced and new dormitories and rest houses built apart from relaying the 100 feet road at a cost of Rs 2 crore from the main circle to the Tungabhadra river bank adjacent to the Matha. The Mukhadwaram has been completed at a cost of Rs. 5 crores. Besides, the new left and right prakarams, including new temple structures dedicated to Manchalasmma or Manchalamma, the reigning Goddess, and Sushameendra Theertha, have been completed at an estimated cost of Rs 4.34 crore, with chief support from the Karnataka Government and other donors. The matha, it is said incurred losses to the tune of Rs 40 crores due to the floods. Yet, it has executed many projects and initiated several other developmental tasks for the poor and needy in and around Mantralaya. Incidentally, Sudha Narayana Murthy, wife of the Infosys founder, Narayana Murthy, donated Rs 1.5 crores towards the project, “Rayarumane” (house of Raghavendra), a scheme for providing shelter and education to 500 orphan and poor children. This building has come up near the Matha itself. The temple authorities also initiated a housing programme at an estimated cost of Rs 25 crore to provide shelter for the poor. Each house they construct will cost about Rs 1.25 lakh. The first few beneficiaries were from Ramachandrapuram village and 50 houses have already been completed. The matha has also spent Rs 2 crore on “Vyasa Teertha Sophisticated Drinking Water Project”, to provide drinking water supply not only to the matha but to the whole town of Mantralaya. The Matha also provided assistance of Rs 2,000 for the owner of each shop on the river bank that was washed away and Rs 10,000 each for the family of each its employees who were badly affected by the floods. The goshala too has been redone after several cows died due to the rising flood waters. The TTD gave Rs 3.5 crore in the form of cows, sheds and other structures under the Kamadhenu programme. Today, the floods are a bad dream and residents of Mantralaya and devotees hope that it would never recur again.